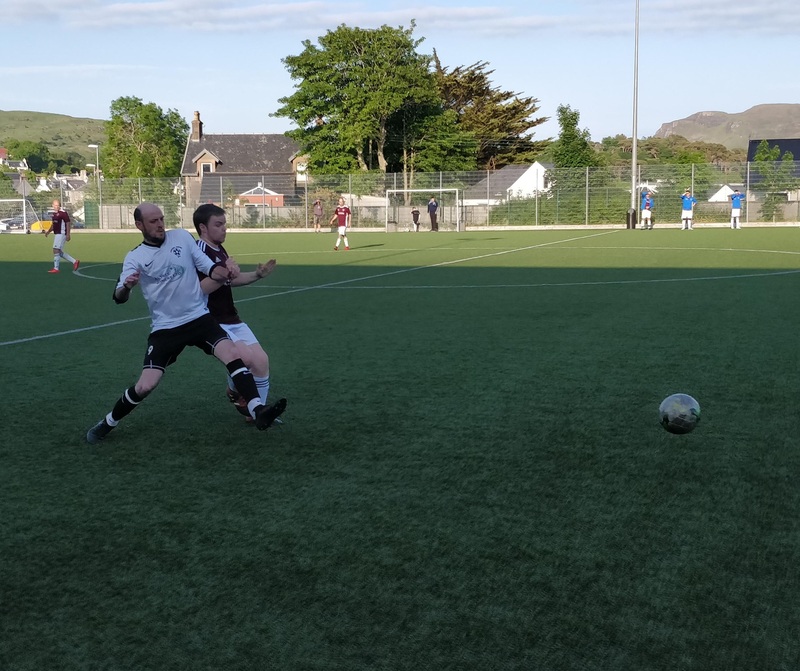 Chris Ross – Portree – and Iain Morrison of Juniors give their all as they challenge for the ball. 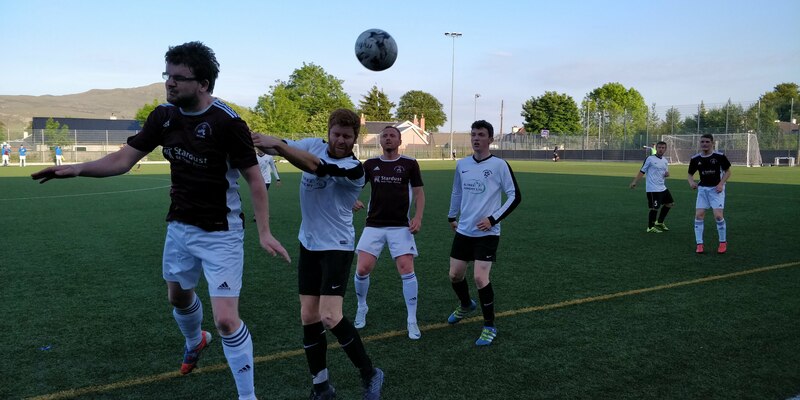 Juniors moved up to second in the table after they recovered from an early setback to hammer their local rivals Portree on Wednesday evening (June 6th). 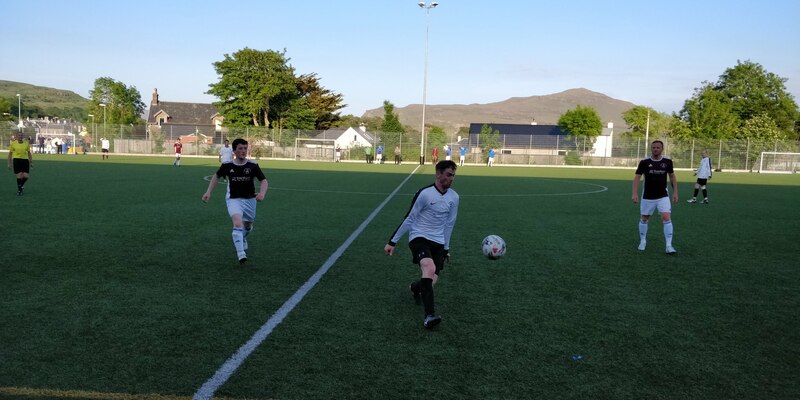 Portree took the lead through their prolific forward Robbie Cameron after just four minutes but trailed 3-1 at the interval after Sean Collins, Chris Mcnab and then John Gillies turned the tide in the visitors’ favour. 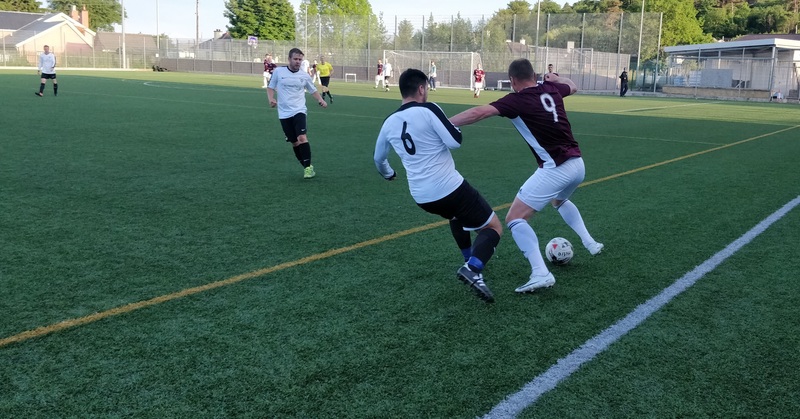 The home team faded after half-time and were outclassed by Phil McCaherty’s side, who added a further three goals courtesy of a James Pringle brace and a second from John Gillies – who was the game’s outstanding performer. 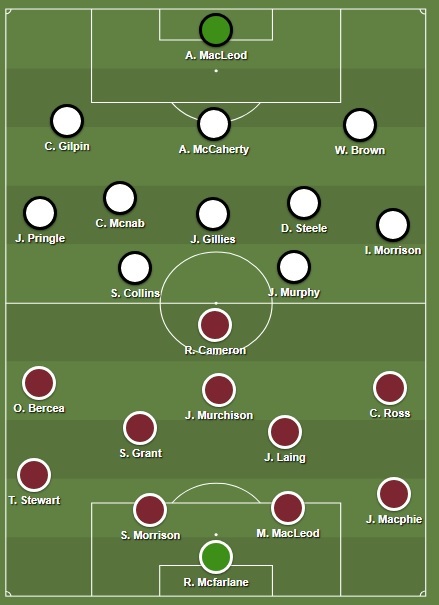 The home team line-up in a 4-4-1-1 formation with Robbie Cameron as a lone striker supported by Jordan Murchison in behind. While the (nominal) visitors opted for a 3-5-2 shape with Sean Collins and John Murphy up top, supported by Iain Morrison and James Pringle, who provided the width from the flanks. Sean Collins and Jamie Macphie battle for possession. Although Phil McCaherty’s side would have been well briefed on the threat of Robbie Cameron before the game, Juniors’ defence wasn’t able to prevent the Portree hitman from giving his side the lead with just four minutes on the clock. Jordan Murchison did well to thread a pass through to Cameron, who never looked like squandering the chance as he confidently dispatched the ball past Andrew MacLeod and into the bottom right-hand corner. The home side had little time to revel in their positive start to the match, however, as Juniors quickly struck back just two minutes later. James Pringle made the most of being afforded far too much time on the ball to pick out Sean Collins who duly put away the opportunity from close range to level the scores. Portree almost hit back just a minute later following some good interplay between Cameron and midfielder Jonathan Laing. The striker played in his teammate with a neat backheel and after embarking on a run into the box, Laing couldn’t quite keep his shot on target as his effort veered wide of MacLeod’s left post. Chris Mcnab (centre) – watched by Jordan Murchison and Robbie Cameron – scored a spectacular second for Juniors. While Juniors’ equaliser was the epitome of simplistic yet decisive attacking, there was nothing straightforward about their second goal, which was right out of the top drawer. Despite having competed in the arduous 17-mile Trotternish Ridge just a few days before, there where no flies on Chris Mcnab as he displayed superb technique to give his side the lead. 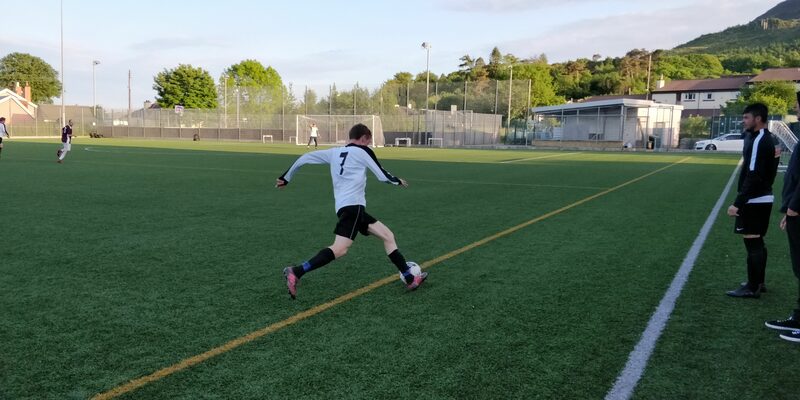 Receiving a pass at pace from the left wing, the midfielder brought the ball under control on the edge of the box before curling a fearsome effort into the roof of the net – giving Ross Macfarlane no chance. Collins should have added to his and Juniors’ tally following a clever slide-rule pass by John Gillies, but the forward uncharacteristically lacked the composure needed and lifted his shot way over the bar. At the other end, Cameron continued to occupy the attention of Juniors’ defence with his movement and link-up play. This time the striker acted as a foil for Ovidiu Bercea who found space on the left, but Bercea wasn’t able to test MacLeod with his effort. Laing was also proving to be a useful outlet for the home team and did well to create a half-chance for Cameron following an enterprising run down the right, however, the experienced striker was closed down and ultimately saw his shot blocked. As the first half drew to a close, Juniors look increasingly likely to score another goal as the game became stretched. Gillies once again exploited space within the Portree defence to pick up John Murphy, who in turn found Collins, but the striker failed to hit the target. Juniors did find the breakthrough shortly before the interval with what was a scrappy goal. 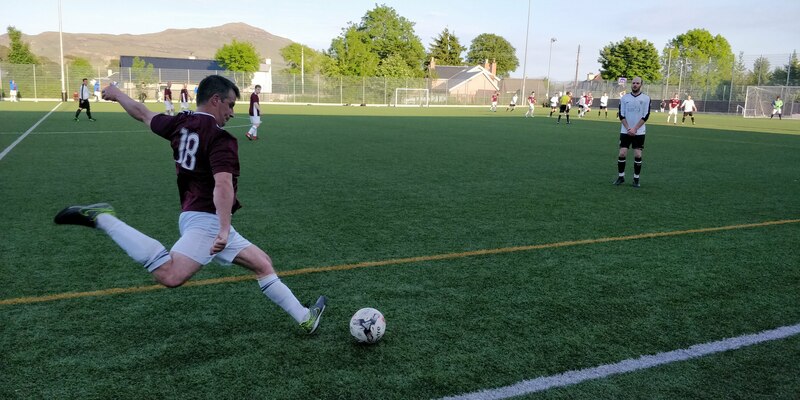 With a stramash threatening to unfold within Portree’s six-yard box, Gillies manage to force the ball over the line – whether by accident or design – to put his side 3-1 up at the break. Juniors’ Danny Steele (near) is closed down by Ovidiu Bercea of Portree. With Juniors now holding a two-goal cushion over their opponents, Mark MacDonald introduced Allan MacKinnon to the fray to bolster his attack in the second period. Murchison was quick to find his teammate with a clever ball over Juniors’ defence, but MacKinnon wasn’t able to bring it down to get a shot away as MacLeod read the situation well. Although already on the scoresheet courtesy of his goal in the first half, Gillies’ really came to the fore in the second half as he went on to dominate proceedings. 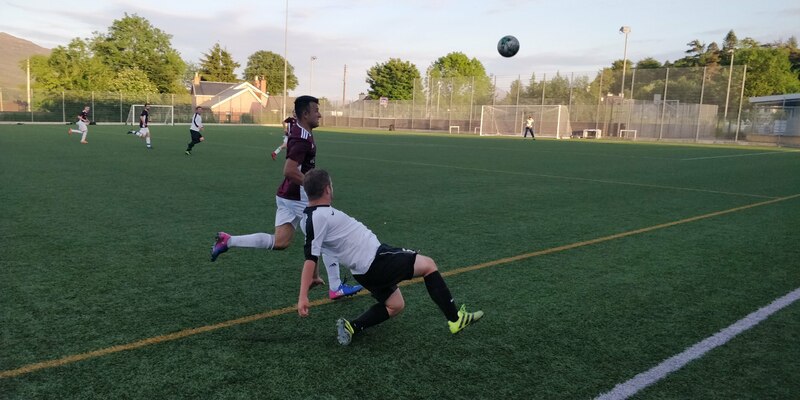 The midfielder went close to scoring his side’s fourth with a sweetly struck effort which just flew over the bar, before going on to set up James Pringle for his first of the game. Stevie Morrison looks to unsettle Juniors’ defence from a free-kick. After some good play involving Danny Steele, Gillies surged down the right-side and found Pringle who steered the ball into the net to put Juniors 4-1 up with 67 minutes on the clock. Gillies then picked out Murphy with a fantastic ball clipped over the Portree defence, but his teammate wasn’t able to control the pass as the chance went awry. Despite their dominance, Juniors had to wait until ten minutes before the whistle to score their fifth, with Gillies grabbing his second of the match. The midfielder exchanged a neat one-two with Pringle before breaking into the box and coolly finishing to put the game out of sight. With Portree tiring, Juniors scored a sixth shortly after. Iain Morrison, who was employed further forward than usual as a wingback, did well to create space for Pringle before cutting it back for his teammate to place the ball past Macfarlane from close range. James Pringle scored twice in an impressive performance. Although Portree attacked in vain for most of the second period, they did break forward towards the end which resulted in a what appeared a questionable sending off. MacLeod was judged to have stopped the ball outside of the box and was promptly show a red by the referee, despite his claims that he had been on the line. 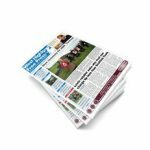 The decision did little to dampen what was a good win for the visitors following their heavy defeat on Saturday at the hands of Mallaig. 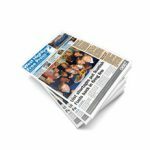 John Gillies: The midfielder’s invention and drive from deep helped to elevate his side to another level, with his two goals and an assist proving pivotal.